Thomas Stephen Monaghan was born in 1937 in Ann Arbor, Michigan, a suburb of Detroit. His father died when he was four years old, and, two years later, his mother placed him and his younger brother James in an orphanage run by an order of nuns, the Felician Sisters. Although his mother was later able to raise the boys on her own, the nuns had a tremendous effect on Monaghan, leading him to consider becoming a priest. At the time, though, he did not have the necessary discipline and was expelled from the seminary. He gained a better sense of discipline by serving three years in the U.S. Marine Corps. Upon his discharge in 1959, Monaghan returned to Ann Arbor and enrolled in the nearby University of Michigan. He studied to become an architect, inspired by the work of Frank Lloyd Wright. In 1960, however, he and his brother James borrowed $500 to buy a pizzeria in nearby Ypsilanti. The previous owners were named Dominic and Nick, and it was called DomiNick’s. Tom changed the name to Domino’s Pizza, and after growing it to four stores bought out his brother by trading a Volkswagen Beetle for his brother's part of the business. The stores were losing money, but with his experience in the college town, Tom Monaghan knew how to, literally, cater to them. He dropped sandwiches from the menu and focused on the pizzas and their delivery. He invented an insulated box that would not only keep the pizza warm but also support the weight of multiple boxes on top of it, allowing several to be delivered at once, without the box’s lid sagging and causing the cheese to be stuck to the top. Monaghan’s emphasis on delivery led him, in 1973, to institute the guarantee of having a pizza delivered within 30 minutes of a phone order being placed, or the order would be free. Domino’s took off as a result of its improved delivery system. Monaghan was able to spread his stores all over North America. By 1983, he had become wealthy enough to buy his hometown baseball team, the Detroit Tigers. In just his first full season as their owner, 1984, they won the World Series. But while his team was making history on the field, Monaghan made two decisions that seemed to insult the team’s off-field history. He announced that Tiger Stadium, which had opened in 1912, needed to be replaced, although he said he wanted a new stadium in the Detroit area, as he was too entrenched in the area to move the team to another city. Although the city government wouldn’t approve the plan to build Tiger Stadium’s replacement, Comerica Park, until the team was sold, Monaghan got the blame for it far more than the new owner. Monaghan also approved the firing of the Tigers’ beloved broadcaster, Ernie Harwell. The outcry from Tiger fans was so great that Monaghan hired Harwell back. In 1992, a reawakening of his Catholic faith led Monaghan to alter his lifestyle. He sold the Tigers to another Detroit-based pizza baron, Little Caesar’s founder-owner Mike Ilitch, who already owned the Detroit Red Wings hockey team. Maintaining his love of Frank Lloyd Wright's architecture, he had Domino’s Ann Arbor headquarters designed to look like a Wright-style building and was in the process of building a Wright-style house when his reawakening occurred. He decided the large house was too ostentatious and stopped construction. The house still sits unfinished. He also sold some of his classic cars and founded/funded Catholic colleges in Ypsilanti and Florida. In 1998, Monaghan sold his controlling interest in Domino’s to Bain Capital, the Boston-based investment firm made nationally famous for its association with Massachusetts politician and eventual Presidential candidate Mitt Romney, for $1 billion. Bain Capital mismanaged Dominos and caused the company to fall into dire straits. In 2001 Monaghan, still holding a 7-percent stake in the company, returned to its management. By 2004, the company had rebounded enough to begin trading on the New York Stock Exchange. By 2011, Domino’s was able to report that about one-third of their orders, and in some countries nearly half of them, were made online. U.S.-based digital sales had topped $1 billion for a one-year period, justifying Monaghan’s belief that home delivery was the way to go. 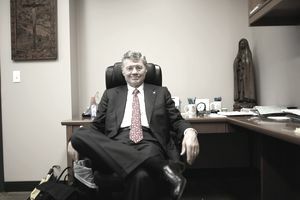 That same year, Monaghan stepped aside from his leadership of Ave Maria University in Florida and got back into the food-delivery business. In his adopted hometown of Naples, Florida, he started Gyrene Burger, reasoning that hamburgers are more popular than pizza. Where Did Fast Food Breakfast Get Its Start?